This is a game between two sides who will be desperate for a win to improve their season. The hosts have a 9-6 record but they have lost three of their last four games. This is nothing compared to the trials and tribulations that Milan are experiencing at the moment though. The Italians have lost their last eight games in the Euroleague, a run which has derailed what was looking like a promising season. The Italians are currently holding a 4-11 record and are in dire need of a victory. This match is going to be the 10th game between these sides in European action and it is the Turkish side with the upper hand at the moment. Fenerbahce have a 6-3 record in the head to head clashes between these sides and they also won the league game this season, winning 70-79 back in December. Kostas Sloukas was the key man for the Turkish side on that occasion and he grabbed 19 points in the win. Over the course of the season, Sloukas has been responsible for 11.9 points per game while offering an average of 5.1 assists per game. Bobby Dixon has also offered up support, providing an average of 11.7 points per game while Ekpe Udoh has grabbed 11.6 points per game and 7.8 rebounds per match. If these players hit form, there is no reason why Fenerbahce cannot start 2017 in the best possible manner. The start of the season was looking promising for Milan but their collapse has been catastrophic. They have endured a terrible run of form, which is all the more bizarre when you consider they have the fourth best offensive record in the league, with an average of 81.7 points per game. Of course, when you have the weakest defence in the league, offering up 88 points per game, you are going to struggle. Rakim Sanders grabbed 17 points when these sides last met and he is averaging 14.4 points per game at the moment. Ricky Hickman is the only other Milan player to break double figures, offering 10.5 points per game. 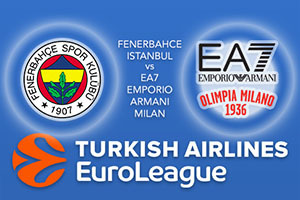 It is hard to look beyond the hosts in this game so take Fenerbahce Istanbul at -13 at odds of 1.90. For the Over/Under market, go UNDER 157.5 at odds of 1.90. Bet Now!